Do Deer Migrate? How Far? No, in Midwestern, Southern and Eastern states, the whitetail deer that most of us hunt do not migrate. In fact they are homebodies, typically living their entire lives in a home range of a mile or so, with buck core areas smaller than that. But yes, in Western states some herds of both whitetails and mule do deer migrate. Based on 40 years of radio-tracking data, Montana biologists have documented that whitetails in the western mountains migrate to dense forests during the winter months. Herds move an average of 8 to 15 miles, going down in elevation as far as needed in search of conifer needles to eat, overhead tree canopy to block the snow and thermal protection created by Douglas fir and other evergreens. As for mule deer, they are the big walkers. For example, in northeast Montana where I hunt most every year, biologists from Fish, Wildlife & Parks have tracked mule deer moving an average of 64 miles from winter range west of Glasgow, Montana to summer fawning areas up in Saskatchewan. 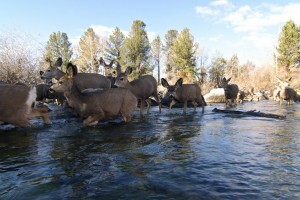 A few years ago, the longest mule deer migration ever recorded was in Wyoming. Thousands of deer migrate 150 miles from winter range in Wyoming’s Red Desert to summer range in the mountains. This 300-mile round-trip journey is the greatest large mammal migration in the continuous United States. The entire migration was documented, and needs to be seen to be believed. Western deer pass migration routes down from generation to generation. It’s possible that if a route becomes blocked the deer will lose it forever and the herds will suffer. As the human population in the West continues to grow, developmental threats to these critical travel corridors, especially for mule deer, are a constant concern. 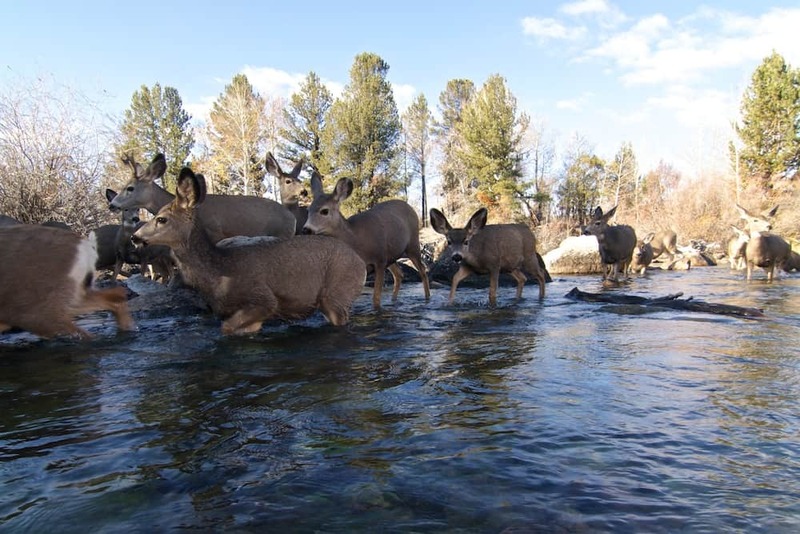 Through land acquisitions and easements, the Mule Deer Foundation and other conservation groups work tirelessly to ensure that the age-old paths between summer and winter range remain intact. This entry was posted in Big Bucks, BigDeer, Deer Hunting, Hanback, whitetail deer by admin. Bookmark the permalink. It is truly sad that we can not all figure out the impact we have on nature. Everyone of us! Eastern whitetails do indeed migrate, whenever I am hunting them they seem to go somewhere else!